A lifelong naturalist and gardener, Sally Roth is the author of the best-selling “Backyard Bird Feeder’s Bible” and other books about birds, nature, and gardening, and a contributing editor for Birds & Blooms magazine. She and her husband Matt Bartmann share their home in the high Rockies with two dogs, one cat, a hard-working packrat named Sisyphus, a well-fed bunch of birds at the feeder, and a stable of old Volvos. An Eye on the Sparrow: The Bird Lover’s Bible by Sally Roth is a must-have book for anyone interested in birds, nature and/or the Bible. Roth transports the reader back to Biblical times and lands in a study of the birds that play prominent roles in well-known Biblical accounts. The author also includes lesser known instances. Verses and stories from the Bible containing references to birds are analyzed. The birds are discussed in detail, providing the reader with information as to the birds’ environments and typical habits in the Biblical era compared to here and now. As soon as I started reading this book, it was obvious that Sally Roth put a great amount of time and effort into writing it. I can tell that Roth did a huge amount of research as the book is written in depth and discusses so many birds. Roth’s passion and enthusiasm for the subject is apparent as well and I love the layout of the book and the style of writing. The humor, knowledge, and little tidbits interspersed throughout left me feeling that I had learned so much about birds, but gained a deeper understanding of Biblical accounts as well. Heather Dieter Bartmann’s illustrations are a nice addition. I am not good at identifying various birds when I see them; therefore it was helpful to see a picture of the bird that I was reading about to help connect the name and details with the illustration. I first got to know Sally Roth through her informative and witty newspaper columns. She is a walking nature encyclopedia, as witnessed by the many books she has written. 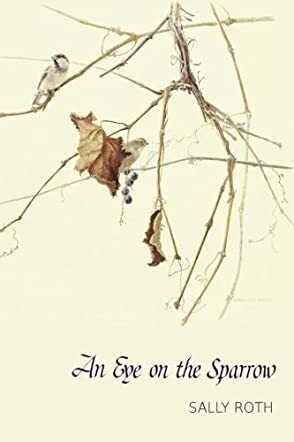 An Eye on the Sparrow shows a different aspect of Sally, showing her broad education and knowledge about Biblical events, combined with extensive knowledge of the birds mentioned in the Bible. The subject is treated in Sally's inimical witty style, in short chapters and side bars so the subject never gets dull. The book is beautifully done, with drawings by the well-kown artist Heather Bartmann. A great treasure! Sally's book is so super fantastic! Not only will you learn about birds and the Bible, you will have fun. You will honestly have fun while you read this book! Be sure to go all the way to the end where you will see some lovely pictures. If you are lucky enough to have met Sally, you will immediately smile and cry at the same time. If you have not had the great fortune to meet her, you will get a tiny glimpse into her life. She is like no other and this book is like no other.